Mark Hempstead is combating Dark Silicon. While that might sound a bit like a recycled Star Wars plot, it’s actually an important piece of research happening at Drexel in hopes of restoring the arc of speed and performance we expect from our mobile devices. Can Mobile Devices Keep Getting Smaller and Faster? A computing trend, described by Intel co-founder Gordon Moore in 1965, whereby the number of transistors able to be put on a microchip seemed to double every two years, set into motion an arms race in the semiconductor industry. Now known as “Moore’s Law,” the observation has become the standard for progress among many digital electronic devices. It has also created the public expectation that devices should continue to get faster and smaller. Hempstead is a professor in the College of Engineering who is looking at the other side of Moore’s law (the dark side, if you will): As microprocessors get smaller and faster, they also run hotter. This is because massive amounts of power are being drawn by small microchips to run the myriad processes of a mobile device. 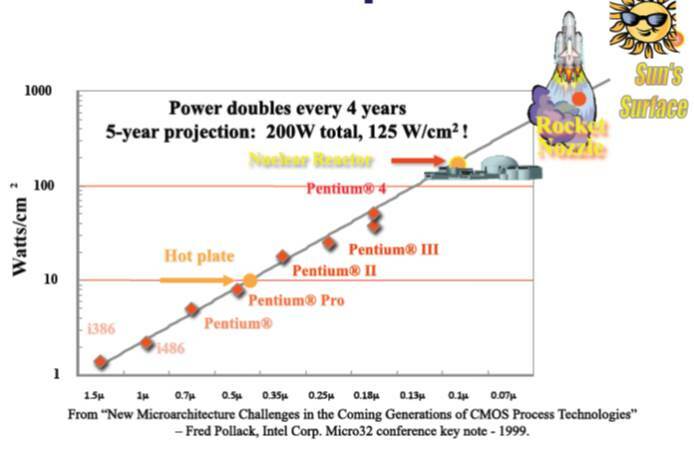 This increase in power density increases the temperature of the chip. If the trend of increasingly powerful computing devices is expected to continue, engineers and designers will have to figure out a way to cool a chip that is on track to grow about as hot as the rocket booster of a space shuttle. Otherwise, the processor overheats and the system will shut down. As microchips get smaller and more powerful, the density of the power causes them to generate more heat when they’re running and presents designers with the challenge of cooling them. Researchers predict that portions of the chip will have to be shut down to avoid overheating -the microchip equivalent of a planned blackout. Chip designers coined the term “Dark Silicon” to describe these switched-off areas. In the eyes of designers and engineers like Hempstead, Dark Silicon is a menacing condition that they’d like to avoid at all costs. This is because it’s terribly inefficient to turn segments of a chip on and off and it forces the system to run slower or with fewer capabilities. One way to avoid the dreaded Dark Silicon is to design specialized, multicore processors –essentially stacks of microchips with designated sets of them dedicated to a single task. Right now, chip makers from Intel to Apple are building processors with up to a dozen separate processing cores, but researchers speculate that within 10 years there could be as many as 1,000 cores going into a device. Hempstead, who leads the Drexel Power-Aware Computing Lab, is at the forefront of electrical engineering researchers who are surveying the multicore landscape, to establish standards for how cores should work together and plan for the future of chip design. In much the same way a city can be divided into manufacturing, commerce and residential sectors, Hempstead speculates that accelerators, dedicating sets of cores that handle a single process such as playing video or word processing, will become a standard of multicore design in the near future. As part of his National Science Foundation-funded research, Hempstead and his team are using computer simulations to stave off Dark Silicon in two ways. First, they’re ensuring that accelerators can interact with each other in an efficient way, so as to avoid power/heat buildup. To do this the group is developing a new, coordinated communication system for the cores. This “memory-interconnect” system will be able to adjust to intermittent usage, bursts of communication and the need to share memory between specialized cores. Secondly, Hempstead’s team is laying the groundwork for future generations of designers to join the fight. If multicore chips and accelerators are to be the solution to the Dark Silicon problem, chip makers will need a new way to explain their designs. So, through the process of designing chips themselves, the researchers are creating a new language for describing the computation and communication capabilities of the accelerators. This will help set standards for chip designers to discuss energy use and workload when laying out multicore processors. You might be the one to strike the final blow in the struggle against Dark Silicon. Power is allocated to various functions of our mobile devices and computers. As accelerators become widely used in devices, designers will need to tailor processors to meet the demands of users. Hempstead speculates that, as multicore design using accelerators becomes the norm, people will have to be more aware of how they use their devices. This could mean filling out a survey before buying your next laptop, or downloading some tracking software that tells the designer which processes you use most. While these plans aren’t exactly restoring freedom to the galaxy, they could help maintain the performance of your Galaxy S…or iPhone, or laptop for that matter.